Our baby girl turned two this month and requested cupcakes for her birthday. She calls them "Happy Birthdays". I love that. She loves the color pink lately and strawberries are one of her favorite fruits, so strawberry cupcakes with strawberry cream cheese frosting was the only way to go! My husband says these are the best cupcakes he's every had and probably his second favorite dessert behind Aunt Betty's Chocolate Cake. They really are that good! **I never frost all of my cupcakes. Instead I put half of them in the freezer, unfrosted and I store the extra frosting in the fridge. Whenever we want cupcakes I grab a few out of the freezer along with the frosting from the fridge. The cupcakes thaw on the counter within 20 minutes or 15 seconds in the microwave. Just frost and enjoy. Fresh cupcakes every day for a week (less in our house)! Place cream cheese, butter and pureed strawberry in a mixing bowl and beat until combined. Mix in the lemon juice (optional but brightens up the flavor). Add the powdered sugar and mix on low until combined then turn mixer to high and beat for 1-2 minutes until frosting is light and creamy. Check the frosting's spreading consistency at this time. Cream cheese frosting tends to be on the soft side so you probably won't need any additional liquid. If the spreading consistency is too stiff mix in some milk 1 teaspoon at a time checking spreading consistency after each addition. Store frosting in the refrigerator until ready to use. 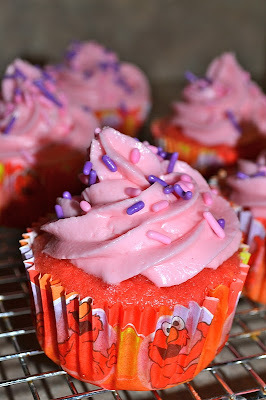 **The strawberry makes the frosting a pale pink. I added a little food coloring to make it brighter.